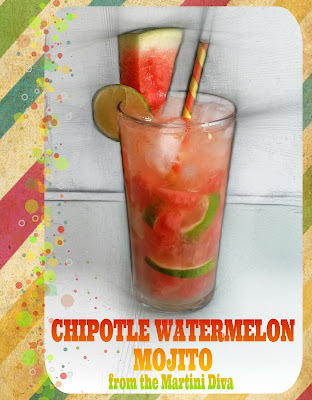 Add the watermelon, lime, mint leaves and simple syrup to your tall glass and muddle to release the juices and the aroma of the mint. Add your rum and your favorite chipotle sauce (I like Cholula), give the cocktail a quick stir. Add a straw and garnish. Why the hot sauce when it's already too hot outside? Because watermelons taste great with a little hot sauce and hot sauce actually helps cool your body down. I had a few fresh cherries left over from my Cherry Peach Whiskey Rickey and I wanted something quick and easy to whip up because I was hot, tired and ready for a cocktail. I needed something tall, cool and really refreshing which was also pretty easy and nothing is more refreshingly easy than a Mojito. I also wanted to console myself because, once again, my work schedule had precluded me from attending Tales of the Cocktail in New Orleans. I was feeling very sorry for myself indeed. 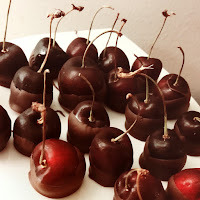 Cherries and rum are a great way to put paid to the doldrums, especially if you add chocolate covered cherries (and leftover peaches from my Grilled Peach Rum Mimosa) to the mix! Within minutes I was ensconced on my deck sipping away and feeling way considerably less sorry for myself. 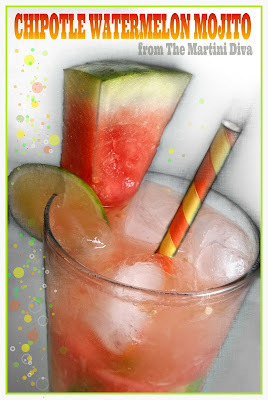 If you need a little pick-me-up from your doldrums try this drink! 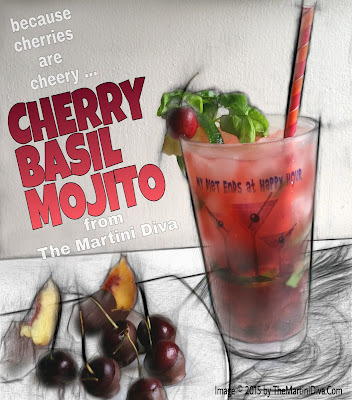 Place the cherries, basil, mint sugar and limes in your glass and muddle together with a cocktail muddler (or the handle of a wooden spoon) until the cherries have released their juices. Add the white rum and stir. Fill your glass with ice then top the drink off with club soda and stir again. 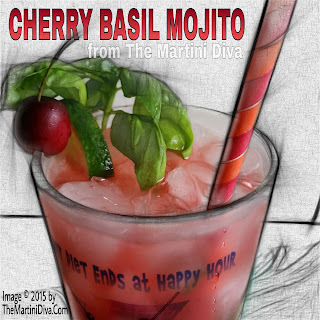 Garnish with a sprig of basil, and or mint, add your Maraschino cherry to the rim and serve. Enjoy, and remember this one next time you have cherries and need to chill out! P. S. If you like Mojitos and pineapple check out how to make my Grilled Pineapple Mojito on my YouTube channel.